This is a funny book with a message that it's good to tidy but it's also good to know when to stop, otherwise you're going to have some problems! Pete the Badger learns to love his home in the forest even if it's a bit messy. The pictures bring out the story beautifully and without them there would be less comedy. My daughter like the story about cleaning. She literally said I like the 'cleaning'. Also the illustrations are very nice. I loved this book. I especially liked when the badger was brushed with a hedgehog!! I would recommend this book. I really enjoyed this book it was a fiction book. My favorite part was when he put cement all over the forest ground and then he couldn`t go underground to his house to eat. I would recommend this to a friend who loves funny books. I liked the first page that had a window in it. I liked the part where all the animals were worried about the leaves dropping. It was a very enjoyable book. A badger that is cleaning up lots and lots! They should read this book because has a moral which tells you that you should not do too much of one thing. This book is a great book a great book for children under 7 because it teaches them a little bit about tidying and that's what the books about. 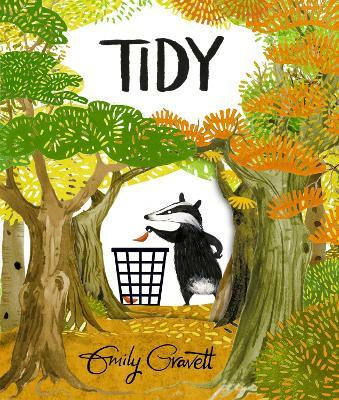 This is a book about tidying up but it ends up to be a tip in the forest. Badger noticed that he was hungry but the food was under the concrete. So he dug it up. Very good book with a good ending.